One to three army mercenaries travel through seven missions to rescue the President of the US. 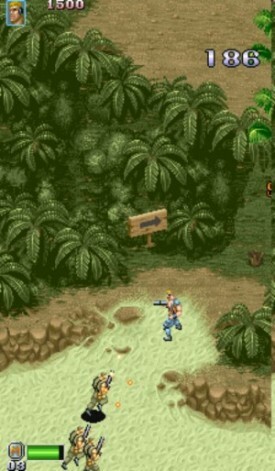 You are armed with unlimited ammo for your gun and a limited supply of bombs to battle army soldiers. Pick up special weapons flame thrower, special guns, more bombs on the way. Ride in jeeps, tanks, and boats on the missions. Playtime is based on a lifeline which decreases as you get hit.